As I recounted to the amusement of many one night on Rundgren Radio (the weekly blog talk radio show for Todd fans), in my first year of college, I had a friend 3 doors down, who had a “kickin' 8-track system”, the latest and greatest thing available back in 1970. John Joyner was from Memphis, his daddy was a lawyer, and he suffered no shortage of life's creature comforts, from the 8-track system to an endless supply of cigarettes to some pretty damn good weed for that day and time. As a lowly small town cop's son, it was rare to experience such delights and to say my musical tastes were limited is putting it mildly. I think I owned maybe 10 albums at the time with the hippest one being Iron Butterfly. Guys like Dean Martin and Herb Alpert filled the family collection and I had an personal affection for soundtracks such as Bullitt, The Good, The Bad, and The Ugly, and Bonnie And Clyde. I did grow up in a college town, so I could claim to having seen a number of groups at the college basketball facility (my first concert was Marvin Gaye at age 14!). One of those that came in 1969 was The Association and I loved their sound and the shimmering harmonies that characterized it. It was through the hours and hours spent in John's room that I developed my love for Buffalo Springfield, The Byrds, Traffic, Cream, and an entire universe of music that I was only marginally aware of up to that point. One group I really liked was The Nazz, who had an coolly synthetic combination of the guitar sound of The Who with the harmonics of The Association. A couple of doors up was Bob Goldman, ANOTHER lawyer's son (starting to see where I fell in the social network of the day? ), from Doylestown, PA., right outside of Philadelphia. One night in the fall of 1970, Bob invited me into his room saying “you have to hear this album”. As I sat down, the first notes of “Broke Down And Busted” floated from the speakers and I felt an immediate familiarity. In fact, I was pretty stunned and immediately identified with the sound, the emotions, and even the whiny voice of that singer, whoever he was. This was the sound that I had been hearing in my head as I listened to all that other music that I had been exposed to. It was like teenage angst pop served up with a rock sensibility and a healthy dose of theatricality. By the third song, “We Gotta Get You A Woman”, I was asking to see the album cover. RUNT. The guy on the cover was the skinniest person I had ever seen. Dressed in clothes that looked they came straight from Carnaby Street including velvet pants, a strange belt with what looked like a kindergarten version of the alphabet printed on it On the back was a picture of what looked like Mickey Mouse, all decked out in a Wizard's hat and using thunderbolts and lightning to conjure up some kind of witches brew. The music became immediately and inextricably tied to the visual image in front of me. Bob told me his name was Todd Rundgren and he was from Philadelphia. I had no awareness of the connection to the Who/Association sound group I had heard in John's room, for as much as I liked that music, THIS music affected me immediately with instant identification that I can only liken to the effect the Beatles sound must have had on those who heard it back in 1962. Unfortunately I never heard the entire album that night. Bob was also spoiled rich brat and by the time the fifth track, “Once Burned”, came on he had made enough snide references to my heritage that we were at each other in the floor of the room. I spent most of the rest of the night chasing Bob around the dorm with whatever I could find to hit him with. True story..... swear to Todd! By the late fall and early winter of 1970, “We Gotta Get You A Woman” was playing in regular rotation and my girlfriend at the time (who is now my wife) and I both turned up the car radio whenever that or Elton John's “Your Song” (our eventual first dance) came on. By mid-summer of 1971, I had the RUNT album as well as RUNT: THE BALLAD OF TODD RUNDGREN in my growing but still fairly small album collection. Today I find it simply incomprehensible that this genius who blazed so many trails and was actually somewhat correct when he characterized himself as for “people who missed The Beatles” is not in the Rock Hall Of Fame. RUNT was actually never supposed to be. Todd Rundgren was scooting along in his post-Nazz production career for Albert Grossman when he got the urge to actually write and record some more music. Playing everything himself, Todd made some demos that his friend Moogy Klingman referred to as “terrible sounding”, but apparently they were good enough to get Todd an advance on a solo record. LA was also home to Hunt and Tony Sales, the bass and drum playing sons of TV personality Soupy Sales. Rundgren had jammed with them some in New York and knew a limited number of musicians in LA, so 17 year old Tony and 14 year old Hunt were recruited to lay down the back beat for the album. In Paul Myers excellent book, A Wizard, A True Star: Todd Rundgren In The Studio, Lowe recounts the symbiotic relationship that he and Rundgren had due to both being musicians first, engineers second, describing Todd's already advanced methods of capturing the recording in a way that allowed the studio to be used as another instrument. As an example, Rundgren was one of the first to insist on discrete miking for each drum in the kit, thus allowing compression and limiters to change the sound at the board. He describes the further rounding and flattening of the sound when coming through a car radio, explaining not only the why Rundgren went for the bright and tiny sound that critics occasionally complained about in his solo work, but also how he managed to make hits like Grand Funk's “We're An American Band”, a sound that was huge compared to other songs on the radio in it's day. 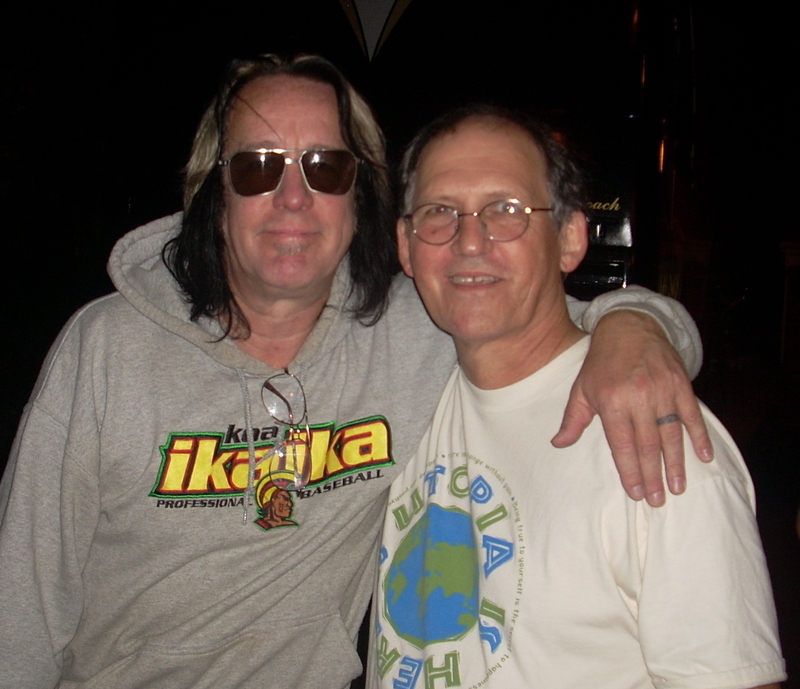 Understanding Todd Rundgren as a producer is prime to understanding his importance to especially the seventies, the entire era of analog studio recording, and why he should be in the Rock Hall. As a matter of fact, if you know Jann Weiner, Rolling Stone founder and primary stick in the Rock N' Roll Hall's rear, go ahead and send him a copy of Myers book. With Rundgren playing guitar or piano live along with the solid foundation of the Sales brothers, most of the basic tracks for RUNT were laid down at the rate of two per day. In the Myers book, Lowe tells how Rundgren would sit right at the board recording and layering the background vocals that would become one of his hallmarks for many years. The song “We Gotta Get You A Woman” is initially recorded as a basic instrumental track of piano, bass, and drums. Lowe then watches in amazement as Rundgren added background vocals, hand claps, percussion and guitars to create an irresistible pop tour-de-force and certified Top 40 hit. To this date, I do not know a single person who claims to have ever heard Rundgren perform this classic live, yet listening to it today, it's a fresh and crisp as the day it was released with wonderfully inventive lyrics, a hook that just won't quit, and a classic lyrical twist to end it, “and when we're through with you. We'll get me one too...” followed by the briefest of flute notes ever. A perfect pop confection that had you reaching for the volume knob whenever it came on. “Broke Down And Busted” was, however, the first track to personally get me from this album. Todd still performs the song to this day and the dragging chords of the opening have become an essential part of the Todd Rundgren sound, much as the droning synthesized background sound of the TODD album defined and became part of Todd's more progressive work. “Believe In Me” was the first song to display Todd's ongoing relationship with the music of Laura Nyro. Over the gentle and pleading piano opening, the track builds as the plaintive vocal appeals to a lover when a relationship appears to be falling apart. Such lyrics were thematic in early Rundgren solo work, causing one critic to refer to him as a “minor songwriter with major woman problems”. I didn't care. I was 20 years old and I HAD major woman problems.... all the time. My hormones were definitely in line with the sound of RUNT and all of Todd's early work. After “We Gotta Get You A Woman” is the first true rocker of the record. “Who's That Man”. Over a blistering seventies rock track, Rundgren decries a the rumor that his woman is with another man, launching into a playful lyrical condemnation that rhymes faster than a rapper on speed. With a verse driven by a frantic conga beat accentuated by Rundgren's lead guitar and a chorus tied to another screaming lead that sounds almost like Lowe's Electric Prunes, “Devil's Bite” is my personal favorite rocker on the record. Flipping the RUNT album over to side 2, things get less poppy and more experimental musically. The first track, “I'm In The Clique” is...well....Zappa-esque! This style Rundgren would reprise often, especially on his classic album, A WIZARD, A TRUE STAR. The track featured a number of New York studio musicians and Moogy Klingman, who along with the Sales Brothers would eventually form the nucleus of the ill-fated first version of Utopia, the prog rock band that Rundgren formed in late 1973. The track itself is very prog rock with heavily processed vocals reflecting upon the hip New York music scene of the early 1970s. The following track is Brian Wilson all the way. “There Are No Words” has.... well... no words. What it does have is about 20 Todd Rundgrens multi-tracked in a harmonious celebration of pure vocals. I hate no one and no other has so far hated me. The tune is a delightful way to end the album. Nestled between “There Are No Words” and “Birthday Carol” was the medley aka “The Baby Let's Swing Medley”, named for it's kickoff song, a pretty much straight up homage to Laura Nyro's music, that then leads to an incredibly engaging and poppy couple of songs, “The Last Thing You Said” and “Don't Tie My Hands”. None of these songs would sound out of place on a Motown record, as one of the Sales brothers noted in the Myers book. The book also reveals that a fourth song was lost in a tape mishap. This medley is so instantly and additively tuneful that even upon first hearing, it almost seemed to me as if this guy was saying 'Hey, I can knock these out anytime I want to”, referring to the hook filled Top 40 play list of the day. Of course, I could not understand why he didn't just make them all entire songs, they were so good. But Rundgren was more of my generation that had grown up on the Beatles, the Who, and Cream, than he was of the previous generation of musicians, like the Beatles, for whom Top 40 success was the benchmark. He was destined to be an ALBUM artist, a move which was not possible in pop music until the Beatles stopped touring and began to make serious music. At any rate, the Medley clinched the deal for me at that time. This was also the era of “Paul Is Dead and it says so in A Day In The Life”, so I thought it even more cool a few years later when I discovered that another version of RUNT existed. This one did not have the Medley, but did have a full out version of “Baby Let's Swing” plus another tune called “Say No More”. Remember... no internet, so unless it appeared in Rolling Stone, Creem, Circus, or any of the other journalistic sources of the day, you just heard about it when you heard about it. I heard it when my friend Mac Evans gave me a puzzled look when I told him how much I liked the Medley on RUNT! Mac was an aspiring songwriter who shared with me a love of the Kinks, Laura Nyro, and Todd Rundgren amongst many others. He later played his version for me with the full “Baby Let's Swing”. This was 1972. Apparently at least 3 versions of the album were released with the one reviewed here being by far the most heard as well as the only one available on CD. RUNT stills stands to me as one of the more astounding debut records ever, with a breadth of variety of musical forms that, upon reflection, foretold the long and successful career that would follow for Rundgren, never a critic's darling, but always a favorite of his very loyal fan base. Todd has recently acknowledged that fan base with album shows based around A WIZARD, A TRUE STAR, the TODD album, and his 80s classic HEALING. Here's hoping that after Todd completes a hopefully successful reincarnation of his acknowledged classic LP, SOMETHING/ ANYTHING, upon it's 40th anniversary in 2012, that he will dig further back and into this organically evolved pop classic and we will finally see that live version of “We Gotta Get You A Woman”.